Most self-balancing robots use some sort of circuitry like gyroscopes or accelerometers to keep them upright. Some bots however, can achieve nearly the same effect by far less complicated means. 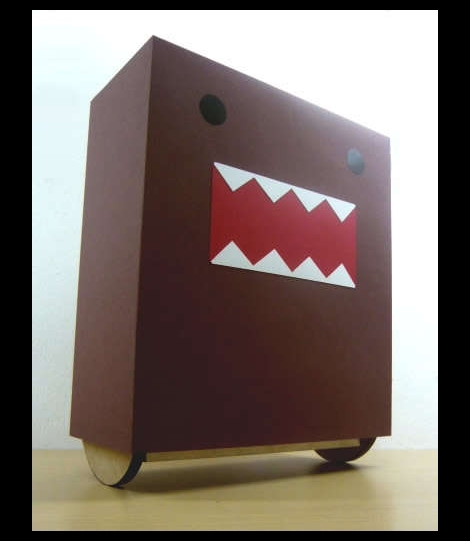 Meet the Domo Kun wobbly bot, created by [Chein]. The robot is essentially a pendulum, where the pivot point is even with the wheel axle. The base of the robot is loaded with batteries, motors, and weights, all of which keep the robot relatively steady while zooming about the room. A light balsa wood frame was fitted to the top of the metal chassis, and a thin cardboard Domo Kun shell was mounted on top of that. The robot is driven using the remote control circuitry that he stripped from a toy car. He also mentions that the positioning of the batteries and weights is key to getting the robot to balance and roll properly – something that took several attempts to get just right. Be sure to check out the pair of videos we have below of the robot chassis in testing as well as the final product. the invisibility functionality at :49 was not mentioned in the writeup! Just like a car achives balance without gyro. That’s nothing. My gyrocopter achieves stability during flight by actually being a helium balloon. So it’s basically a boxy weeble-wobble with wheels. I think this is a great way to get back to basics. We all get wrapped up in doing things the hard way. Instead of spending time trying to get a robot to balance just build a balanced robot! This is much better that the un-balanced robot I built. First it loved me, then it tried to kill me. Ha, awesome build. Love the simplicity of it and the finish. This would make a great sidewalk advert menu etc. Now all that’s needed is for him to add two arms that swing counter to each other as it rolls.